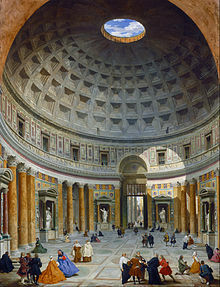 The English word "dome" ultimately derives from the Latin domus ("house") from ancient Greek δόμος (dómos), which, up through the Renaissance, labeled a revered house, such as a Domus Dei, or "House of God", regardless of the shape of its roof. This is reflected in the uses of the Italian word duomo, the German/Icelandic/Danish word dom ("cathedral"), and the English word dome as late as 1656, when it meant a "Town-House, Guild-Hall, State-House, and Meeting-House in a city." The French word dosme came to acquire the meaning of a cupola vault, specifically, by 1660. This French definition gradually became the standard usage of the English dome in the eighteenth century as many of the most impressive Houses of God were built with monumental domes, and in response to the scientific need for more technical terms. When the base of the dome does not match the plan of the supporting walls beneath it (for example, a dome's circular base over a square bay), techniques are employed to bridge the two. One technique is to use corbelling, progressively projecting horizontal layers from the top of the supporting wall to the base of the dome, such as the corbelled triangles often used in Seljuk and Ottoman architecture. The simplest technique is to use diagonal lintels across the corners of the walls to create an octagonal base. Another is to use arches to span the corners, which can support more weight. A variety of these techniques use what are called "squinches". A squinch can be a single arch or a set of multiple projecting nested arches placed diagonally over an internal corner. Squinches can take a variety of other forms, as well, including trumpet arches and niche heads, or half-domes. A single or double layer space frame in the form of a dome, a braced dome is a generic term that includes ribbed, Schwedler, three-way grid, lamella or Kiewitt, lattice, and geodesic domes. The different terms reflect different arrangements in the surface members. Braced domes often have a very low weight and are usually used to cover spans of up to 150 meters. Often prefabricated, their component members can either lie on the dome's surface of revolution, or be straight lengths with the connecting points or nodes lying upon the surface of revolution. Single-layer structures are called frame or skeleton types and double-layer structures are truss types, which are used for large spans. When the covering also forms part of the structural system, it is called a stressed skin type. The formed surface type consists of sheets joined together at bent edges to form the structure. The ellipsoidal dome is a surface formed by the rotation around a vertical axis of a semi-ellipse. Like other "rotational domes" formed by the rotation of a curve around a vertical axis, ellipsoidal domes have circular bases and horizontal sections and are a type of "circular dome" for that reason. Geodesic domes are the upper portion of geodesic spheres. They are composed of a framework of triangles in a polyhedron pattern. The structures are named for geodesics and are based upon geometric shapes such as icosahedrons, octahedrons or tetrahedrons. Such domes can be created using a limited number of simple elements and joints and efficiently resolve a dome's internal forces. Their efficiency is said to increase with size. Although not first invented by Buckminster Fuller, they are associated with him because he designed many geodesic domes and patented them in the United States. The hemispherical dome is a surface formed by the rotation around a vertical axis of a semicircle. Like other "rotational domes" formed by the rotation of a curve around a vertical axis, hemispherical domes have circular bases and horizontal sections and are a type of "circular dome" for that reason. They experience vertical compression along their meridians, but horizontally experience compression only in the portion above 51.8 degrees from the top. Below this point, hemispherical domes experience tension horizontally, and usually require buttressing to counteract it. According to E. Baldwin Smith, it was a shape likely known to the Assyrians, defined by Greek theoretical mathematicians, and standardized by Roman builders. An oval dome is a dome of oval shape in plan, profile, or both. The term comes from the Latin ovum, meaning "egg". The earliest oval domes were used by convenience in corbelled stone huts as rounded but geometrically undefined coverings, and the first examples in Asia Minor date to around 4000 B.C. The geometry was eventually defined using combinations of circular arcs, transitioning at points of tangency. If the Romans created oval domes, it was only in exceptional circumstances. The Roman foundations of the oval plan Church of St. Gereon in Cologne point to a possible example. Domes in the Middle Ages also tended to be circular, though the church of Santo Tomás de las Ollas in Spain has an oval dome over its oval plan. Other examples of medieval oval domes can be found covering rectangular bays in churches. Oval plan churches became a type in the Renaissance and popular in the Baroque style. The dome built for the basilica of Vicoforte by Francesco Gallo was one of the largest and most complex ever made. Although the ellipse was known, in practice, domes of this shape were created by combining segments of circles. Popular in the 16th and 17th centuries, oval and elliptical plan domes can vary their dimensions in three axes or two axes. A sub-type with the long axis having a semicircular section is called a Murcia dome, as in the Chapel of the Junterones at Murcia Cathedral. When the short axis has a semicircular section, it is called a Melon dome. A paraboloid dome is a surface formed by the rotation around a vertical axis of a sector of a parabola. Like other "rotational domes" formed by the rotation of a curve around a vertical axis, paraboloid domes have circular bases and horizontal sections and are a type of "circular dome" for that reason. Because of their shape, paraboloid domes experience only compression, both radially and horizontally. Also called sail vaults, handkerchief vaults, domical vaults (a term sometimes also applied to cloister vaults), pendentive domes (a term that has also been applied to compound domes), Bohemian vaults, or Byzantine domes, this type can be thought of as pendentives that, rather than merely touching each other to form a circular base for a drum or compound dome, smoothly continue their curvature to form the dome itself. The dome gives the impression of a square sail pinned down at each corner and billowing upward. These can also be thought of as saucer domes upon pendentives. Sail domes are based upon the shape of a hemisphere and are not to be confused with elliptic parabolic vaults, which appear similar but have different characteristics. In addition to semicircular sail vaults there are variations in geometry such as a low rise to span ratio or covering a rectangular plan. Sail vaults of all types have a variety of thrust conditions along their borders, which can cause problems, but have been widely used from at least the sixteenth century. The second floor of the Llotja de la Seda is covered by a series of nine meter wide sail vaults. 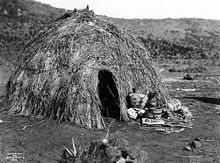 Cultures from pre-history to modern times constructed domed dwellings using local materials. Although it is not known when the first dome was created, sporadic examples of early domed structures have been discovered. The earliest discovered may be four small dwellings made of Mammoth tusks and bones. The first was found by a farmer in Mezhirich, Ukraine, in 1965 while he was digging in his cellar and archaeologists unearthed three more. They date from 19,280 – 11,700 BC. Persian architecture likely inherited an architectural tradition of dome-building dating back to the earliest Mesopotamian domes. Due to the scarcity of wood in many areas of the Iranian plateau, domes were an important part of vernacular architecture throughout Persian history. The Persian invention of the squinch, a series of concentric arches forming a half-cone over the corner of a room, enabled the transition from the walls of a square chamber to an octagonal base for a dome in a way reliable enough for large constructions and domes moved to the forefront of Persian architecture as a result. Pre-Islamic domes in Persia are commonly semi-elliptical, with pointed domes and those with conical outer shells being the majority of the domes in the Islamic periods. The Beyazidiye Mosque (1501–1506) in Istanbul begins the Classical period in Ottoman architecture, in which the great Imperial Mosques, with variations, resemble the former Byzantine basilica of Hagia Sophia in having a large central dome with semi-domes of the same span to the east and west. Hagia Sophia's central dome arrangement is faithfully reproduced in three Ottoman mosques in Istanbul: the Beyazidiye Mosque, the Kılıç Ali Pasha Mosque, and the Süleymaniye Mosque. Three other Imperial mosques in Istanbul also add semi-domes to the north and south, doing away with the basilica plan: Şehzade Camii, Sultan Ahmed I Camii, and Yeni Cami. The peak of this classical period, which lasted into the 17th century, came with the architecture of Mimar Sinan. In addition to large Imperial mosques, he produced hundreds of other monuments, including medium-sized mosques such as the Mihrimah, Sokollu, and Rüstem Pasha Mosque and the tomb of Suleiman the Magnificent. Süleymaniye Mosque, built in Constantinople (modern Istanbul) from 1550 to 1557, has a main dome 53 meters high with a diameter of 26.5 meters. At the time it was built, the dome was the highest in the Ottoman Empire when measured from sea level, but lower from the floor of the building and smaller in diameter than that of the nearby Hagia Sophia. Pre Islamic south Asian domes date probably from Shunga period where domes are shown in the buddhist relief carvings. Earliest surviving examples of true dome structure in south asia are Gumbatona vihara in Swat, Pakistan and domes of Takht e bahi, Amaravati relief from second secondly AD in south india shows ribbed domes in buddhist temples, which shows that building domes was widespread in the sub continent before the islamic invasion.. Islamic domes were constructed with stone, brick and mortar, and iron dowels and cramps. Centering was made from timber and bamboo. The use of iron cramps to join together adjacent stones was known in pre-Islamic India, and was used at the base of domes for hoop reinforcement. The synthesis of styles created by this introduction of new forms to the Hindu tradition of trabeate construction created a distinctive architecture. Domes in pre-Mughal India have a standard squat circular shape with a lotus design and bulbous finial at the top, derived from Hindu architecture. Because the Hindu architectural tradition did not include arches, flat corbels were used to transition from the corners of the room to the dome, rather than squinches. In contrast to Persian and Ottoman domes, the domes of Indian tombs tend to be more bulbous. The historicism of the 19th century led to many domes being re-translations of the great domes of the past, rather than further stylistic developments, especially in sacred architecture. New production techniques allowed for cast iron and wrought iron to be produced both in larger quantities and at relatively low prices during the Industrial Revolution. 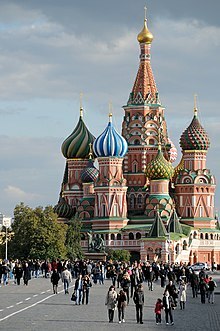 Russia, which had large supplies of iron, has some of the earliest examples of iron's architectural use. Excluding those that simply imitated multi-shell masonry, metal framed domes such as the elliptical dome of Royal Albert Hall in London (57 to 67 meters in diameter) and the circular dome of the Halle au Blé in Paris may represent the century's chief development of the simple domed form. Cast-iron domes were particularly popular in France. ^ Nobile & Bares 2015, p. 4. ^ Rovero & Tonietti 2012, p. 183. ^ Blockley 2014, p. 22. ^ Larson & Tyas 2003, p. 32, 38. ^ Arun 2006, pp. 304-305. ^ MacDonald 1958, p. 2-3, 7. ^ Giustina 2003, p. 1037. ^ Minke 2012, p. 57-59, 127. ^ a b Makowski 1962, p. 62. ^ a b c Chen & Lui 2005, p. 24-18. ^ Chen & Lui 2005, p. 24-18, 24-19. ^ Ramaswamy & Eekhout 2002, p. 141. ^ Chen & Lui 2005, p. 24-2, 24-18. ^ Saka 2007, p. 595. ^ a b c d Arun 2006, p. 304. ^ a b c Langmead & Garnaut 2001, p. 131. ^ Escrig, Cobreros & Valcarcel 1997, pp. 355-356. ^ Escrig, Cobreros & Valcarcel 1997, p. 358. ^ Cobreros Vime & Vázquez-Vicente 1999, p. 599. ^ Cobreros Vime & Vázquez-Vicente 1999, pp. 599-601, 606. ^ Ashkan & Ahmad 2009, p. 102, 108–109. ^ Lehmann 1945, p. 247, 254–255. ^ Freely & Çakmak 2004, p. 90-93, 95–96. ^ Schütz 2002, p. 356–357. ^ Stephenson, Hammond & Davi 2005, p. 175–176. ^ Betts 1993, p. 5–7. ^ Huerta 2007, p. 230–232. ^ Nuttgens 1997, p. 187–189. ^ Meister, Michael W. "Temples along the Indus". EXPEDITION-PHILADELPHIA-. ^ "Amaravati: The art of an early Buddhist monument in context" (PDF). ^ Stein, Sir Aurel (1974). On Alexander's Track to the Indus: Personal Narrative of Explorations on the North-West Frontier of India Carried Out Under the Orders of H. M. Indian Government. Ares Publishers. ISBN 9780890050361. ^ Tappin 2003, p. 1941, 1943–1944. ^ Tappin 2003, p. 1944, 1946–1947. ^ Tappin 2003, p. 1944, 1948–1949. ^ Bradshaw et al., p. 693. ^ Bradshaw et al., p. 693-694, 697. ^ Bradshaw et al., p. 701-702. ^ Bradshaw et al., p. 700, 703. Bagliani, Stefano (May 2009). "The Architecture and Mechanics of Elliptical Domes" (PDF). Proceedings of the Third International Congress on Construction History, Cottbus. Archived from the original (PDF) on 2013-10-16. Bardill, Jonathan (2008). "Chapter II.7.1: Building Materials and Techniques". In Jeffreys, Elizabeth; Haldon, John; Cormack, Robin (eds.). The Oxford Handbook of Byzantine Studies. Oxford University Press. ISBN 978-0-19-925246-6. Baumann, Dorothea; Haggh, Barbara (May 1990). "Musical Acoustics in the Middle Ages". Early Music. 18 (2): 199–210. doi:10.1093/em/xviii.2.199. Betts, Richard J. (March 1993). "Structural Innovation and Structural Design in Renaissance Architecture". Journal of the Society of Architectural Historians. 52 (1): 5–25. doi:10.2307/990755. JSTOR 990755. Blockley, David (2014). Structural Engineering: A Very Short Introduction. Oxford, UK: Oxford University Press. p. 144. ISBN 978-0-19-165208-0. Born, Wolfgang (April 1944). "The Introduction of the Bulbous Dome into Gothic Architecture and its Subsequent Development". Speculum. 19 (2): 208–221. doi:10.2307/2849071. JSTOR 2849071. Bradshaw, Richard; Campbell, David; Gargari, Mousa; Mirmiran, Amir; Tripeny, Patrick (June 1, 2002). "Special Structures: Past, Present, and Future" (PDF). Journal of Structural Engineering. 128 (6): 691–709. doi:10.1061/(ASCE)0733-9445(2002)128:6(691). Burckhardt, Jacob (1987). Murray, Peter (ed.). 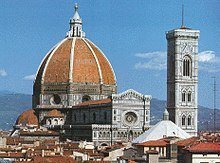 The Architecture of the Italian Renaissance. Translated by James Palmes (illustrated, reprint ed.). Chicago: University of Chicago Press. ISBN 978-0-226-08049-9. Chen, W. F.; Lui, E. M. (2005). Handbook of Structural Engineering (2, illustrated, revised ed.). Boca Raton, Florida: CRC Press. p. 1768. ISBN 978-1-420-03993-1. Creswell, K. A. C. (January 1915). "Persian Domes before 1400 A.D.". The Burlington Magazine for Connoisseurs. 26 (142): 146–155. JSTOR 859853. Dodge, Hazel (1984). Building Materials and Techniques in the Eastern Mediterranean from the Hellenistic Period to the Fourth Century AD (PhD Thesis ed.). Newcastle University. hdl:10443/868. Dror, Ben-Yosef (2011). "Area F – Soundings in the Fortifications". In Zertal, Adam (ed.). El-Ahwat, A Fortified Site from the Early Iron Age Near Nahal 'Iron, Israel: Excavations 1993–2000. BRILL. pp. 162–173. ISBN 978-9-004-17645-4. Dumser, Elisha Ann (2010). "Dome". In Gagarin, Michael; Fantham, Elaine (eds.). The Oxford Encyclopedia of Ancient Greece and Rome. 1. New York, NY: Oxford University Press, Inc. pp. 436–438. ISBN 978-0-195-17072-6. Earls, Michael W. (1971). "The Development of Structural Form in Franconian Rococo". In Malo, Paul (ed.). Essays to D. Kenneth Sargent. Syracuse, New York: The School of Architecture, Syracuse University. pp. 127–139. Escrig, F.; Cobreros, A.; Valcarcel, J.P. (1997). "The Elliptical Dome. A survey of constructive techniques to stabilize a sopisticated structure" (PDF). Transactions on the Built Environment. 26: 355–364. Fernández, Santiago Huerta; Hernández-Ros, Ricardo Aroca (1989). "Masonry Domes: A Study on Proportion and Similarity" (PDF). 10 Years of Progress on Shell and Spatial Structures: 11–15 September 1989. 1. Retrieved April 18, 2014. Fleming, John; Honour, Hugh; Pevsner, Nikolaus, eds. (1991). Dictionary of Architecture (4th ed.). Penguin Books. ISBN 978-0-14-051241-0. Fletcher, Sir Banister (1996). Dan Cruickshank (ed.). Sir Banister Fletcher's A History of Architecture (illustrated, reprint, 20th revised ed.). Architectural Press. ISBN 978-0-7506-2267-7. Fuentes, P.; Huerta, S. (2010). "Islamic Domes of Crossed-arches: Origin, Geometry and Structural Behavior". In Chen, Baochun; Wei, Jiangang (eds.). ARCH'10 – 6th International Conference on Arch Bridges, October 11–13, 2010 (PDF). Fuzhou, Fujian, China. pp. 346–353. ISBN 978-953-7621-10-0. Archived from the original (PDF) on 2014-04-27. Retrieved 2015-03-13. Fusco, Annarosa Cerutti; Villanni, Marcello (2003). "Pietro da Cortona's Domes between New Experimentations and Construction Knowledge". In Huerta, S. (ed.). Proceedings of the First International Congress on Construction History, Madrid, 20th–24th January 2003 (PDF). Madrid: I. Juan de Herrera. pp. 579–591. ISBN 978-84-9728-070-9. Grabar, Oleg (March 1990). "From Dome of Heaven to Pleasure Dome". Journal of the Society of Architectural Historians. 49 (1): 15–21. doi:10.2307/990496. JSTOR 990496. Gye, D. H. (1988). "Arches and Domes in Iranian Islamic Buildings: An Engineer's Perspective". Iran. 26: 129–144. doi:10.2307/4299807. JSTOR 4299807. Hassan, Ahmad Sanusi; Mazloomi, Mehrdad; Omer, Spahic (2010). "Sectional Analysis of Pendentive Dome Mosques During Ottoman Era" (PDF). Canadian Social Science. 6 (5): 124–136. Retrieved February 22, 2015. Hassan, Ahmad Sanusi; Mazloomi, Mehrdad (December 2010). "The Importance of Plan Unit Design with Reference to Pedentive Dome Mosque Architecture in Early Ottoman Period in Balkan Region and Anatolia". Review of European Studies. 2 (2): 105–116. doi:10.5539/res.v2n2p105. Howard, Deborah (1991). "Venice and Islam in the Middle Ages: Some Observations on the Question of Architectural Influence". Architectural History. 34: 59–74. doi:10.2307/1568594. JSTOR 1568594. Huerta, Santigo (2007). Oval Domes: History, Geometry and Mechanics (PDF). Nexus Network Journal. 9. pp. 211–248. doi:10.1007/978-3-7643-8699-3_4. ISBN 978-3-7643-8444-9. Karydis, Nikolaos D. (2012). The Early Byzantine Domed Basilicas of West Asia Minor. An Essay in Graphic Reconstruction (PDF). Late Antique Archaeology. 9. pp. 357–381. doi:10.1163/22134522-12340013. ISBN 9789004309777. Archived from the original (PDF) on 2015-05-29. Retrieved May 29, 2015. Kayili, Mutbul (2005). "Acoustic Solutions in Classic Ottoman Architecture" (PDF). Publication ID 4087. FSTC (Foundation for Science Technology and Civilisation) Limited: 1–15. Krautheimer, Richard (1980). "Success and Failure in Late Antique Church Planning". In Weitzmann, Kurt (ed.). Age of Spirituality: A Symposium. New York: Metropolitan Museum of Art. pp. 121–140. ISBN 978-0-87099-229-2. Kuban, Doğan (1987). "The Style of Sinan's Domed Structures". Muqarnas. 4: 72–97. doi:10.2307/1523097. JSTOR 1523097. Larson, Olga Popovic; Tyas, Andy (2003). Conceptual Structural Design: Bridging the Gap Between Architects and Engineers (illustrated, reprint ed.). Thomas Telford. ISBN 978-0-72773-235-4. MacDonald, William (1958). "Some Implications of Later Roman Construction". Journal of the Society of Architectural Historians. 17 (4): 2–8. JSTOR 987944. Makowski, Z. S. (1962). "Braced Domes, Their History, Modern Trends and Recent Developments". Architectural Science Review. 5 (2): 62–79. doi:10.1080/00038628.1962.9696050. Mark, Robert; Billington, David P. (1989). "Structural Imperative and the Origin of New Form". Technology and Culture. 30 (2): 300–329. doi:10.2307/3105106. JSTOR 3105106. McClendon, Charles B. (2005). The Origins of Medieval Architecture: Building in Europe, A.D 600–900 (illustrated ed.). Yale University Press. ISBN 978-0-300-10688-6. McVey, Kathleen E. (1983). "The Domed Church as Microcosm: Literary Roots of an Architectural Symbol". Dumbarton Oaks Papers. 37: 91–121. doi:10.2307/1291479. JSTOR 1291479. Minke, Gernot (2012). Building with Earth: Design and Technology of a Sustainable Architecture (3rd; revised ed.). Berlin, Germany: Walter de Gruyter. ISBN 978-3-034-60872-5. Mitchell, James H. (1985). "The Noble Dome". The Antioch Review. 43 (3): 261–271. doi:10.2307/4611482. JSTOR 4611482. Nobile, Marco Rosario; Bares, Maria Mercedes (2015). "The use of 'false vaults' in 18th century buildings of Sicily". Construction History. 30 (1): 53–70. JSTOR 44215897. Ousterhout, Robert (2008). "Chapter II.7.2: Churches and Monasteries". In Jeffreys, Elizabeth; Haldon, John; Cormack, Robin (eds.). The Oxford Handbook of Byzantine Studies. Oxford University Press. ISBN 978-0-19-925246-6. Ramaswany, G. S.; Eekhout, Mick (2002). Analysis, Design and Construction of Steel Space Frames (illustrated, reprint ed.). London, UK: Thomas Telford, Ltd. p. 242. ISBN 978-0-727-73014-5. Rasch, Jürgen (1985). "Die Kuppel in der römischen Architektur. Entwicklung, Formgebung, Konstruktion". Architectura. 15: 117–139. Rizzoni, Giovanni (2009). "The Form of Parliaments & European Identity". In Rorato, Laura; Saunders, Anna (eds.). The Essence and the Margin: National Identities and Collective Memories in Contemporary European Culture. The Netherlands: Rodopi. pp. 183–198. ISBN 978-9-042-02571-4. Robison, Elwin C. (December 1991). "Optics and Mathematics in the Domed Churches of Guarino Guarini". Journal of the Society of Architectural Historians. 50 (4): 384–401. doi:10.2307/990663. JSTOR 990663. Rovero, L.; Tonietti, U. (2012). "Structural behaviour of earthen corbelled domes in the Aleppo's region". Materials and Structures. 45: 171–184. doi:10.1617/s11527-011-9758-1. Saka, M. P. (2007). "Optimum geometry design of geodesic domes using harmony search algorithm". Advances in Structural Engineering. 10 (6): 595–606. Skempton, A. W. (2002). A biographical dictionary of civil engineers in Great Britain and Ireland: 1500–1830 (illustrated ed.). Thomas Telford. ISBN 978-0-7277-2939-2. Tabbaa, Yasser (1985). "The Muqarnas Dome: Its Origin and Meaning". Muqarnas. 3: 61–74. doi:10.2307/1523084. JSTOR 1523084. Tsan-wing, NG; Kin-wah, LEUNG (2001). "Deformation Survey for the Preservation of Lei Cheng Uk Han Tomb". The 10th FIG International Symposium on Deformation Measurements. Session VIII: Structural Deformations. 19 – 22 March 2001 (PDF). Orange, California, USA. pp. 294–301. ISBN 978-0-86078-686-3. Archived from the original (PDF) on 6 February 2004. Wallis, Kendall (2010). "Bearing Bandmann's Meaning: A Translator's Introduction by Kendall Willis". In Bandmann, Günter (ed.). Early Medieval Architecture as Bearer of Meaning. Translated by Kendall Wallis. Columbia University Press. ISBN 978-0-231-50172-9. Wilkie, David S.; Morelli, Gilda A. (2000). "Forest Foragers: A Day in the Life of Efe Pygmies in the Democratic Republic of Congo". Cultural Survival Quarterly. 24 (3). Retrieved December 7, 2010. Wittkower, Rudolf (1999). Art and Architecture in Italy 1600–1750: III. Late Baroque. Revised by Joseph Conners and Jennifer Montagu (6th ed.). Yale University Press. ISBN 978-0-300-07941-8. Yaghan, Mohammad Ali Jalal (2003). "Gadrooned-Dome's Muqarnas-Corbel: Analysis and Decoding Historical Drawings". Architectural Science Review. 46 (1): 69–88. doi:10.1080/00038628.2003.9696966.